Light therapy is an innovative, non-invasive treatment used to treat a wide variety of skin conditions and is most effective when used in combination with other treatments to help augment and maintain their results. Light therapy is an increasingly popular treatment, both in-office and at-home, that is able to treat a range of skin complaints. With different light frequencies used for everything from acne to hyperpigmentation, it’s not surprising the painless procedure is proving so popular. It is often used as an add-on therapy after undergoing another cosmetic treatment, but there are many at-home solutions as well. We spoke to AEDIT Provider Dr. Julie Russak on the different options and benefits of each. Light therapy is used to treat a wide variety of skin conditions by using different wavelengths depending on the results you are seeking. Board Certified Dermatologist Dr. Julie Russak often treats patients with psoriasis, vitiligo, eczema, acne, or other common conditions. This innovative and pain-free treatment is proving to be particularly popular with those seeking a preventative approach to skincare and the aging process. This is especially true since light therapy is claimed to help treat the accelerated aging process caused by exposure to light-producing computer and phone screens. In-office light therapy is also used to help improve the appearance of scarring. The treatment can be used in conjunction with other more invasive procedures such as fillers since it helps calm the skin after injectables. The extra step adds around 20 to 30 minutes onto the treatment time and can improve a patient’s comfort after a more painful procedure. Light therapy’s broad range of uses is turning it into a go-to treatment for patients seeking non-invasive solutions. The most promising element of LED light therapy is that researchers have not found any adverse side effects caused by the treatment. This means even patients who are restricted from other therapies due to sensitivity or allergies should be able to handle LED treatment. The versatility offered means sessions can be adjusted to meet a patient’s specific needs to achieve personalized results. Best practice is to start your light therapy treatment in-office, so a board-certified dermatologist can assess your skin and provide you with a detailed skin care regimen to work with the light therapy. Both in-office and at-home devices take advantage of the skin’s natural ability to metabolize light. We asked Dr. Russak about how viable light therapy is as a standalone treatment, and she said: “Light therapy is a non-invasive yet effective add-on and not a stand-alone treatment. Light therapy is most effective when used in combination with other treatments to augment their results and maintain them.” Results offered by light therapy differ depending on the color of the light used as well as the equipment’s strength. Red light is used to help combat conditions that are linked to the overproduction of sebum, a natural oil produced by skin that can become problematic when produced in large quantities such as active acne as well as other complaints including rosacea and sun damage. This particular frequency penetrates the skin and promotes cell regeneration. Blue light aids in combating bacteria that contributes to specific skin complaints, including acne-causing bacteria. 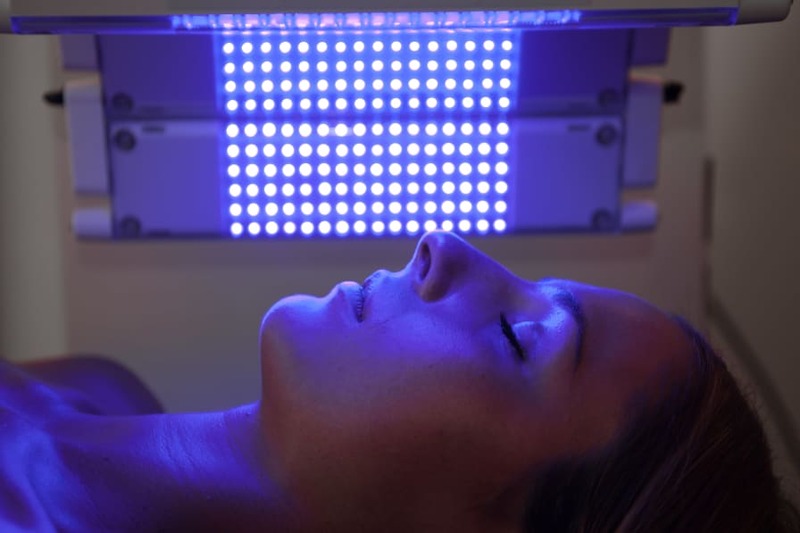 Unlike UV treatments widely used to tan skin, LED blue light is not harmful and can be a great asset to those seeking treatment for skin conditions that have a bacterial cause. This frequency can also promote the production of collagen. Yellow light is less widely used mainly due to it being a newer frequency used in dermatological treatment. So far the color has been shown to penetrate the skin, similar to red light, but it does not travel through as many layers. It is now being used to treat issues such as melasma (dark spots). Green light penetrates just below the skin’s surface and can be beneficial when used in conjunction with red or blue lights to treat conditions such as acne. It is best to check with a board-certified dermatologist before moving forward with treatment because it can activate cells that could negatively affect the progress of your existing acne treatment. In-office light therapy uses medical-grade dermatologically tested equipment that is calibrated to suit each patient’s needs. According to Dr. Russak, in-office treatments are recommended in particular for patients who have never had any form of light therapy in the past. The FDA-approved LED lights used in-office are much stronger than at-home devices, producing more effective results. Even younger patients are seeking light therapy as a preventative approach to aging, a trend dermatologists across the States are observing. Light therapy can be an excellent option for aiding in achiveing a more youthful glow. “Light therapy kicks collagen and elastin production into overdrive,” explains Dr. Russak. “We use our red light panel for example, on patients desiring an anti-aging regimen, since red light has been proven to reduce the appearance of fine lines and wrinkles significantly,” says Dr. Russak. Patients can expect to see results more quickly than when using at-home devices, and often notice visible results as soon as the treatment is finished, and often continue to improve over the next six to eight weeks after treatment. Your provider will discuss how frequently you should have in-office treatments, which depending on the condition being treated, can range from once a week to once a month. Treatments generally cost anywhere from $50 to $300 depending on the technology used and the areas treated. In-office options are the best course of action for initial treatment but can be combined with at-home devices for optimum results. Both mainstream and high-end cosmetic brands are dipping their toes into at-home light therapy products. Dr. Russak explains there is value in using these devices, but more “as a maintenance solution” and follow-up to in-office treatments. There is a wide range of products on the market available at different price points, but the main thing to look out for is an FDA approved device. That said, there are many at-home light therapy options that have met the required safety standards. The popular drugstore brand Neutrogena launched a targeted acne light pen and full face mask that is a great affordable option. Similarly, Dr. Dennis Gross Skincare released a light mask that is said to specifically combat the effects of light emitted by technology, which could be particularly appealing to those who work on computers all day. At the higher end of the market, leading in-office LED treatment provider, LightStim also offers an at-home solution. The real indicators of the effectiveness of these products can be found in the strength of the light emitted as well as the coverage offered by the device itself. An easy way to gauge this is to look for the frequency and amount of time the product should be used. You should also take into account what you are looking to treat; for example, if you have occasional breakouts or localized acne scarring, a targeted pen could be a good option for you in between dermatologist appointments. On the contrary, if you are looking to use light therapy to combat signs of aging or to reduce the effects of light emitted by computer screens, a red light emitting device that offers fuller coverage would be advisable. Noticeable results will take a little longer when using at-home devices due to the products being much weaker than those used in-office. Talk to a board-certified dermatologist about his or her recommended light therapy products best suited for your specific needs and desired results. Overall, light therapy can be used as an effective treatment for a multitude of skin complaints, most of which are linked to the overproduction of sebum or a lack of collagen. While at-home devices are not as strong as those used in practices, they do play a role in getting maximum benefits from treatments, and dermatologists will happily advise patients the best at-home product to suit their specific needs. While research hasn’t found any adverse side effects, the most commonly reported issue with using LED masks is light sensitivity, however, most devices now include protective glasses to prevent any potential damage or pain in the eye area.